Craig Horbinski, MD, PhD, associate professor of Pathology and Neurological Surgery, was a co-author of the Nature paper. A team of scientists has developed a new method for identifying drug targets in the aggressive brain tumor glioblastoma and discovered that a key gene — previously overlooked by traditional approaches — may represent a promising new target for therapy. 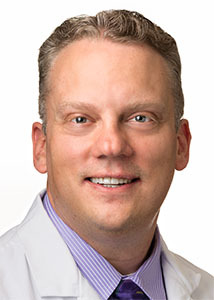 The study, published in the journal Nature, was co-authored by Craig Horbinski, MD, PhD, associate professor of Pathology and Neurological Surgery. Glioblastoma, the most common form of adult brain tumor, is a lethal cancer with a median survival of just 15 months. There is no cure, and current treatment options tend to extend patients’ lifespan only modestly. Previously, most laboratory research in the area has focused on in vitro cellular models. But drug therapies based on targets discovered in vitro have had limited clinical success for glioblastoma patients, in part because such cell models poorly match how the cancer behaves in humans. In the current study, Horbinski and collaborators demonstrated a new, more efficient method to screen for potential drug targets in glioblastoma. The team developed an in vivo functional screening strategy — using models of mice implanted with human glioblastoma cells, which closely mirrored the natural tumor environment — to identify changes in cancer gene regulation. They then compared those results with screening results from cells in a dish. The scientists discovered that many of the genes necessary for cancer cell growth in the brain were in fact not found to be required in the culture dish — suggesting that traditional methods might be failing to identify potential targets. Implementing the new screening method also revealed that a previously overlooked gene called JMJD6 played a key regulatory role in cancer cells in vivo. The scientists further demonstrated that inhibition of JMJD6 significantly extended survival in mouse models. The findings would likely not have occurred without the novel screening approach. The research also has promising applications in other areas where novel therapeutic targets are needed. Horbinksi is also director of the Mouse Histology and Phenotyping Laboratory and of the Nervous System Tumor Bank. The research, led by scientists at the Cleveland Clinic and Case Western Reserve University, was supported by National Institutes of Health grants CA183510, GM007250, CA189647, CA154130, CA169117, CA197718, CA171652, NS087913 and NS089272; Velosano; the New York Stem Cell Foundation-Robertson Investigator Award; philanthropic support from the Goodman family; and the CIHR Banting Fellowship.